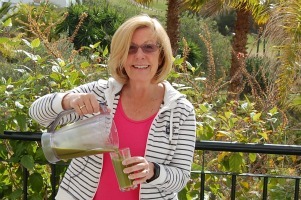 A Breakfast Smoothie Recipe To Turbo Charge Your Day! This Breakfast Smoothie Recipe will help you take an uncomplicated peek into the world of Juicing and Smoothies! All you need is a simple blender. Have you read about juicing and smoothies and wondered if you should invest in a juicer only to find out that you don’t use it often and the device gets put on the shelf to collect dust? So you gave up the idea. Well.. Healthy Breakfast smoothies can be made in a simple blender. Here’s the difference.. In a juicer the fibre is separated from the juice and disgarded. This means you can drink the pure goodness of the juice without your system having to digest all the fibre too. We probably wouldn’t choose to sit down and chomp on spinach and cucumber and apples as a meal. Using a blender the fibre of the vegetables is broken down into a smooth drink. This makes the breakfast Smoothies quicker to make because there’s no cleaning of parts and discarding of fibre. As you develope a taste for healthy smoothies and you like the way you feel you might want to try juicing too but for now let’s look at my basic Breakfast Smoothie Recipe. Base – An apple makes the perfect base but bottled water or ice cubes made with bottled water is good too. Greens – baby spinach, chard, kale or cos lettuce, cucumber, celery. Use one or two or all in any combination that you like the taste of. Fruit – banana, kiwi, pear. To keep the sugar content low and not de-rail the alkaline detoxing effect of the breakfast smoothie recipe use only half or one fruit. 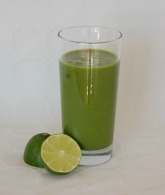 Zing – This is something I learned from Jason Vale.. the juice of half a lemon or I prefer lime gives this smoothie a fresh, slightly sharp taste! This one is an option although I feel this breakfast smoothie recipe wouldn’t be complete without a teaspoon of nature’s superfood, either Spirulina or Wheatgrass. These are an aquired taste but rounds off your healthy breakfast with a giant scoop of vitamins, antioxidants and other trace elements to fortify your body. Now whizz until smooth, pour into your favorite glasses and sip slowly! You can adjust the taste however you wish with the combination of veggies but don’t add too much fruit or the sugar level will be too high. Think about your smoothie as a meal in a glass. You might find it’s one of the best healthy breakfast foods, quick and simple, fresh and with a spoonful of Wheatgrass or Spirulina containing all the nourishment you need as part of your healthy diet. Look After You.. Inside & Out! Eat Smart Move More! can help you to claw back your energy and vitality? There are lots of ideas and a fitness training plan along with fitness charts to help you monitor your success. The High Energy Diet is all about Foods for long term success!